Attention Retention at Fort Worth Contemporary Arts. While walking through Walmart one day, I saw a group of about six people staring at a very clever product promotion. Under a large sign that read, “Clearance—High Velocity Floor Fans—$34”, was a shiny, chrome fan, pointing straight up, on full blast. Hovering in midair above the fan was a large multi-colored beach ball. The beach ball is kept in place by Bernoulli‘s Principle, which states that air that is moving at a high speed has lower pressure than still air. The air moves around the ball to create a pocket of low-pressure air. When the ball moves to the side of the pocket, it will be pushed back in, and the upward force from the air stream keeps the ball aloft. It is a neat trick that some recognize from their junior high physics class, or a children‘s science museum. However, it was not the trick that grabbed my attention, it was the group of paralyzed consumers that had gathered around the display, they were transfixed. What was it about this simple action that not only commanded attention but was able to retain it longer than most people interact with an artwork at a museum or gallery? This made me wonder what would happen if the same device was redefined as an art object. Would it captivate an audience in the same way? Could it function as a Duchampian readymade when recontextualized in a gallery setting? Almost as if it was social experiment, and an attempt to answer these questions, I brought the beach ball and fan into the gallery. 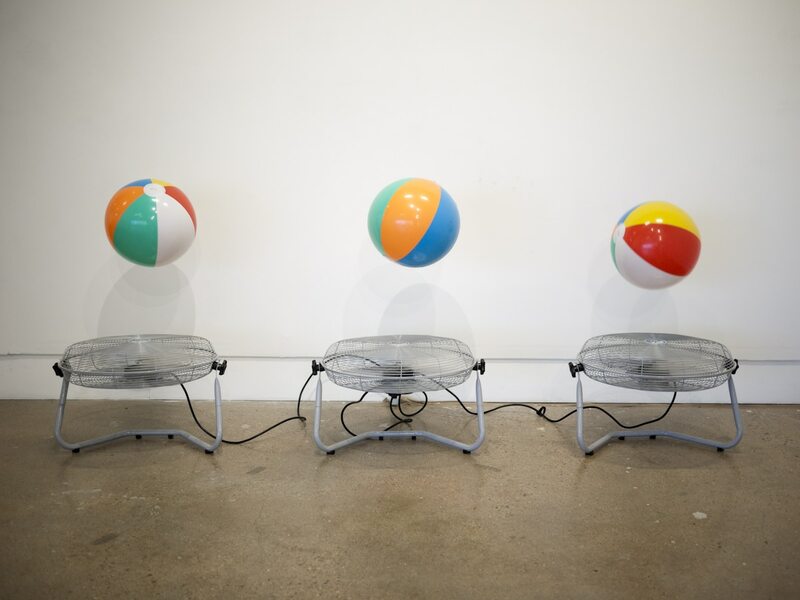 Attention Retention, is three floor fans placed in a row, each levitating a 16” beach ball. 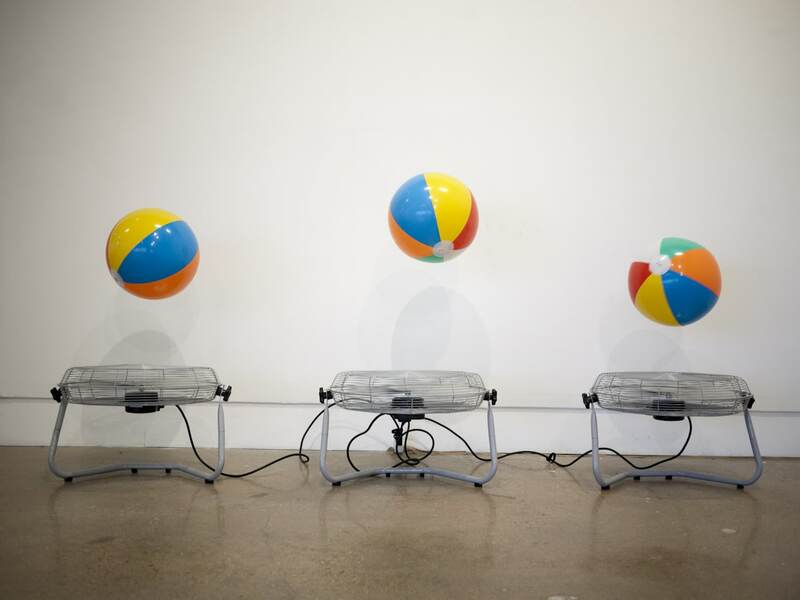 The three balls danced in a constant rhythm above the fans, creating a colorful space of repetitive action, it was hypnotizing, not only in retaining the gaze of the viewer but demanding attention from the audience. 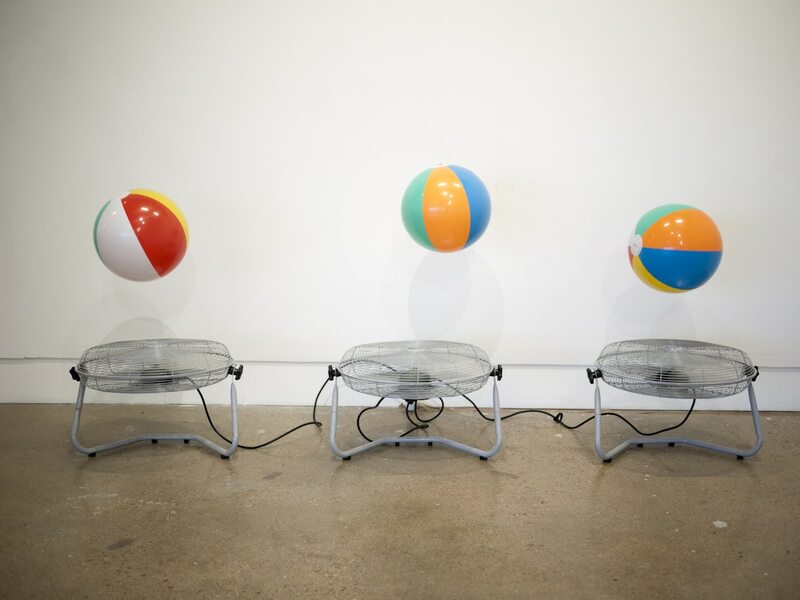 May 24, 2014 | Filed under ARTWORKS, EXCLUDED, SCULPTURE and tagged with artist, beach balls, bradly brown, bradly brown artist, contemporary art, fans, found object art, installation art, ready mades, sculpture.